These scones are the best scones I've ever had. The nutmeg is the secret ingredient. I often make them with currants instead of raisins, so why not use raspberries too? Or cranberries... now there's an idea! Mix dry ingredients in a bowl. Cut in shortening. Add raisins and milk. Stir just until it all holds together. Pat out and cut into 1 inch thick squares and place on a cookie sheet dusted with corn meal. Mix dry ingredients in a bowl. Cut in shortening til it is pea sized. (If using olive oil, add to mixture at the same time as the milk.) Add cheese and mix well. Add milk. Stir just until it all holds together. Pat out on a floured (or corn mealed) board and cut into 1 inch thick circles and place on a cookie sheet dusted with corn meal. These are excellent with broccoli soup or squash soup. Add wet ingredients. Stir with a wooden spoon just until it all holds together. If the dough seems too dry, add more yoghurt or buttermilk. Pat out on a floured board. Pat it out to ½" thick and cut into rounds. Place on a parchment papered cookie sheet. Using a dinner fork, pierce through the center of each round two or three times. Bake on the middle or one higher shelf of the oven at 500 400ºF for 5 minutes. Turn the cookie sheet around and bake 5 minutes more. These are excellent with sausage gravy or fried chicken. For muffins Oil muffin tins. Pour oil into a cast iron pan. Turn the oven to 350F and place the pan in the oven as it preheats. Mix wet ingredients (including oil if using muffin or loaf tins in another bowl. For muffins and bread in loaf tin Add dry ingredients to wet ingredients. Mix just enough to combine the two. For bread - if using cast iron pan Add dry ingredients to wet ingredients. Mix almost enough to combine the two. Pour heated oil over top and quickly stir to combine. For muffins Spoon into greased muffin tins. Bake at 350F for 35-40 minutes til golden brown. 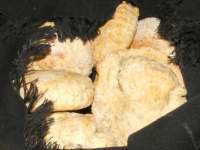 For bread - if using loaf tin Pour batter into paper lined loaf tin and bake 350F 40-50 minutes til golden brown. For bread - if using cast iron pan Sprinkle cornmeal into preheated cast iron pan. Pour batter into pan and bake 350F 40-50 minutes til golden brown. Sometimes I add corn niblets and/or grated monterey jack cheese and/or chopped green chilies to the wet ingredients. When chilies are added, I also add a bit more sugar. When we add chilies, we cut them up about half an half an hour before making the cornbread, and pour about ¼ c the sugar overtop (the way you would if you were getting strawberries ready). The chilies soak up some of the sugar so that when they go into the wet ingredients and get cooked, they are sort of candied. Really wonderful. This recipe is great with chili and/or for breakfast with butter and maple syrup or honey. If there are day-old muffins or bread left, they make terrific Stovetop Dressing. 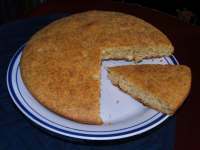 There is also a yeasted corn bread recipe. Beat eggs. Stir in sugar, oil and pineapple. Add carrots, coconut, raisins and pecans. Mix well. Stir in vanilla. Mix dry ingredients in another bowl. Pour pineapple mixture into dry ingredients. Stir just enough to mix together. Spoon into 16 to 18 greased muffin tins and bake for 25 to 30 minutes at 350F. Wash orange well. Chop orange (peel and all! - no seeds though) in pieces and put in food processer until the rind is finely ground. Add juice, dates, egg and oil and whir it around again. Mix dry ingredients in a bowl. Pour orange mix into dry ingredients. Stir just enough to mix together. Put in greased muffin tins and bake for 15 minutes at 400F. If you are making bread, line loaf tin with wax paper and bake for 55 minutes at 350F. Based on Edna Staebler's sister Ruby's orange date muffin recipe included in the article entitled "Muffins in Minutes" by Edna Staebler published in "Entertaining and Recipes" October/November 1983. I love this wonderful date bread. It is one I remember having many times as a child. When I asked my mother to send me the recipe, I was surprised to hear that it is not her recipe at all but my mother's friend Shirley's mother's recipe. (Whoa!! How convoluted! Did you get that??) When Aunt Shirley and my mother were 12, they made this date bread for the first of many times together in Aunt Shirley's mother's kitchen. Pour boiling water over dates. Let cool. Drain, reserving liquid. Cream together sugar, shortening vegetable oil and egg. Sift together, salt, baking soda and flour. Add to creamed mixture gradually, alternating with the date water. Add dates, nuts, vanilla. Line loaf tins with wax paper. Bake at 325F for 1½ to 2 hours. I don't usually condone making muffins that require THREE bowls for mixing but these muffins are pretty spectacular. They are well worth having to do extra bowl washing. Cream Cheese Mixture Put cream cheese into a small bowl. Using a wooden spoon, cream the marmalade into the cheese til there are no lumps. Stir in one beaten egg. Set bowl aside. Muffins Turn oven on to 350F. Mix the other egg, oil, sugar (or honey) and banana in a medium sized bowl. Mix dry ingredients in yet another bowl. Add the banana mixture to the dry ingredients. Stir just enough to mix together. Put it all together Spoon muffin mixture into 12 greased muffin tins. Poke indentations into the center of each muffin to make a well. Spoon the cream cheese mixture evenly into the wells.